Last month, I had the opportunity to be a guest on a television talk show. It's called Kitty Talk, and it's a weekly Canadian talk show for South Asian women. 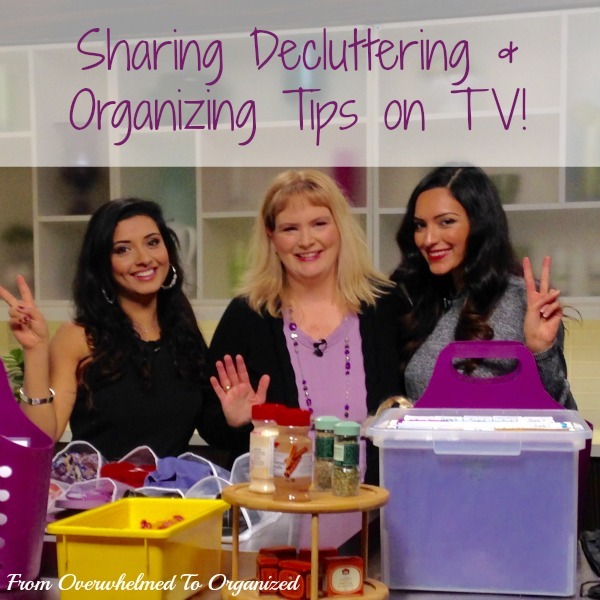 I was there to share some decluttering and organizing tips. It was really exciting and I'm so happy to finally be able to share it with you! The whole thing happened quite quickly... I got an email from a fellow professional organizer who had been contacted by a producer from Rogers Television. My colleague didn't want to appear on the talk show and wondered if I would be interested. What?! Me appear on TV?! Um... that sounds way beyond my comfort zone. But, since it wasn't a guarantee anyway (it had been several hours since the producer contacted my colleague so I figured she'd probably already found someone else... and besides, she probably contacted my colleague because she's been a professional organizer for 10 years, and she wouldn't be interested in me when I've only been doing it for 2 1/2 years...I'm great at rationalizing things away! ), I figured I'd say yes. At the time I thought it was a small local community cable TV show so how bad could that be if they did say yes, right?! And, as a family, we'd decided our word of the year for 2016 was going to be "Yes". Little did I know what that would entail for me! Within minutes, the producer contacted me to confirm I'd be available for the taping... it was a go! That was late on a Wednesday and the taping was Friday afternoon. And panicking in between all of that! On the day of the show I got myself ready, packed everything into my car, and made my way to the studio. I was really starting to think this was a crazy idea. Why did we think "Yes" was a good word for the year? What if I can't think of enough to say for 6 1/2 minutes? What if I say something that will offend South Asian women? What if I sound unprofessional? What if I am bringing too many products to show? Yep I was a big ole' bucket of nerves! And of course my hubby... who's always my biggest cheerleader. He gave me advice, listened to me rehearse, and kept telling me how proud he was of me for doing this. From the moment I arrived at the studio, everything was a blur. My organizing products were taken into the studio and I was whisked into make-up. Holy wow... I've never had so much make-up on in my life! Here's a picture my hubby took of me when I got home... I feel like a clown LOL! After make-up it was time to get my microphone on and then I met the hosts on the set (there ended up just being 2 of them that day). We had about a minute to chat and they asked me what I wanted to talk about. Guess they didn't get the 3 questions I'd sent in. I didn't have time to panic about that though. I gave them a few general topics and then we were ready to record! Then things really were a blur. I was flying by the seat of my pants through the whole first segment. I responded to their questions and tried to tie in the things I'd planned to talk about the best I could. And before I knew it, they were wrapping up the segment. What?! How did 6 1/2 minutes go that quickly?? I felt pretty good about it though. And I was definitely glad I'd planned as much as I did in advance, because it gave me confidence to fly by the seat of my pants. Then I had a couple of minutes to set up my "props" at the counter before we started recording the 2nd segment. I scrapped a couple of things, because I knew this segment was going to feel even shorter than the first. Before we started, the studio took a quick picture of us with all the products. I'd hoped to have some way to hang an over-the-door shoe organizer, so I could pop all kinds of different items in and out, to show a variety of ways they can be used to maximize vertical space in our homes. But they weren't able to set anything up for it, so one of the hosts held it up. 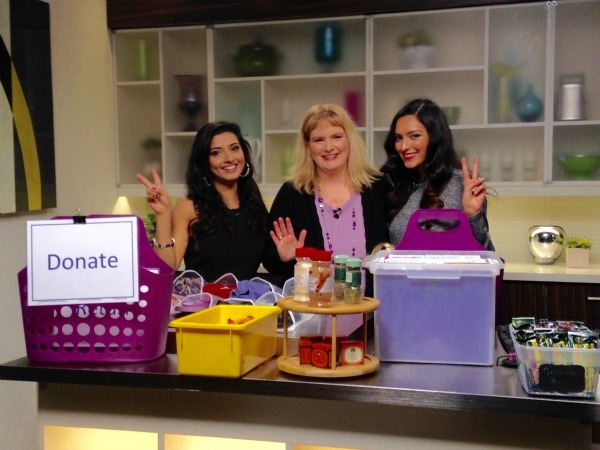 And then we taped the organizing products segment. It was another blur and time flew by. But I actually enjoyed this segment and tried to just have fun with it. And then I was done! I was only at the studio for about an hour. I was happy that it went as well as I felt it did, and I was definitely relieved that it was over. Without any Further Ado... Here's the Video! 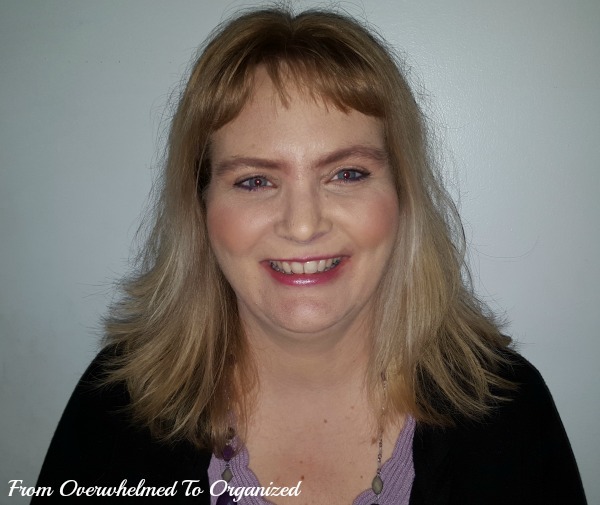 OK, here are my organizing and decluttering tips, as shared on Kitty Talk! OK, back to the video... It was an exciting day around here when we watched the show on TV (a week after the taping). My kids not only think I'm famous now... but so are their stuffed animals and toys LOL! And yes... I checked... those 6 1/2 minutes really were 6 1/2 minutes... despite how quickly they flew by at the taping! I'm really happy with how the show turned out and it was a really great learning experience. I'm definitely glad I stretched beyond my comfort zone and said yes to this! It was a wonderful opportunity. And I hope the tips help some people declutter and organize their homes! Woot woot. Congrats. Hahaha.. your kids are winning. Famous stuffed toys and mommy!! Congrats Hilda. Some an honor! Thanks for the shout out. I do appreciate it. You're most welcome Linda! Technical stuff like that is not my thing so I'm grateful for your help! Thanks Sarah! I saw your TV segment and knew we could relate to each other! Congrats, Hilda!! I remember my first time on TV. It was live at 6AM and I had just gotten home the night before from an out of state job. Talk about nerve wracking! But I'll tell you what, doing that proved to myself that I could something really outside of my comfort zone. Now I film for the local TV station twice a month and have a relationship with a national company for blogging and occasional videos. You never know where that one YES will lead you! Great job! Thanks Andi! Stretching is a good thing from time to time. I'm glad to hear your stretching led to such a great opportunity! Congratulations!